AV Digitech, an emerging Sri Lankan advertising venture, has come up with some innovative solutions with its entry to new age digital advertising solutions. The company recently introduced a Mobile LED Trailer that is ideal for a multitude of purposes such as advertising and sponsorship activities, as well as live outdoor TV screenings, branding exercises or just making a massive statement either outside any commercial premises or mobile on the road. “The New Mobile LED Trailer is a 15’ by 8’ inches P8 LED screen is powered by a 20 KVA on board generator, with 200W sound system that comes along with 2 speakers and an amplifier. It is also ideal to use to power a sound system or to use as part of a stage rig either at a one-day event, or over a number of days. According to AV Digitech officials whether you are searching to promote your event, make the event much bigger and more professional in a high quality format, the company’s new product can help businesses reach their customers in a much attractive platform,” according to a company media release. “This platform can even be used for Concerts, Corporate Events, Sports marketing, Trade Shows, Product Launches and activations, Showroom openings, Long term campaigns or any outdoor activities,” company’s Managing Director/CEO Seniya Samarasekera who founded AV Productions as a leading, advertising and event management company back in 1992 and today with nearly 25 years’ experience associated with AV Productions. AV Digitech is a new age digital solutions provider with a vision to create out of the box solutions that inspire business growth. “Today the world has changed and Marketing is not what it used to be. The radio and television landscape in our dynamic and ever evolving country changed irrevocably and Pay TV is now taking over homes whilst YouTube and Facebook along with other social media platforms are now major Medias that take most of the consumer products to the end consumer’s head. However, above all the traditional billboards that used to position brands in human minds too have now changed to more digital platforms,” it said. 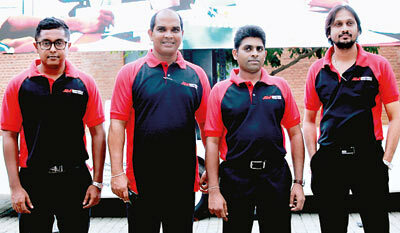 Photo Caption: From left: C. Risheharan – Graphic & IT, Seniya Dinnage Samarasekara – Managing Director, Amal Bandara – Director and Shyamal Hewage – Head of Oparations.